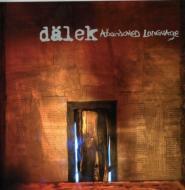 Finally, after 2 long years we present Dalek's masterpiece ABANDONED LANGUAGE. Self-described as their DARK SIDE OF THE MOON, PET SOUNDS ala Dalek. The layering is still there, but the instrumentation is totally different. In fact, from the sinister strings in Lynch to old-school hip hop flavor of Isolated Stare to the heady melodicism of Tarnished, ABANDONED LANGUAGE is complex enough for fans of avant-noise but accessible enough for mainstream hip hop audiences.